A morning of fun with Dad takes a turn for the boring when a long to-do list interferes. At first content to let Dad cross things off his list, the boy in the story soon realizes that the whole day will be spent on chores — unless he can come up with a solution. 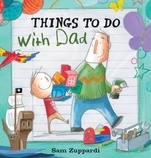 In his singularly expressive, kid-friendly style, author-illustrator Sam Zuppardi crafts a colorful celebration of the fun that can be had with just a little imagination — and a trusty green crayon. Can a young boy figure out how to turn an obstacle into an opportunity in this nearly wordless picture book? Sam Zuppardi is the author-illustrator of The Nowhere Box and Jack’s Worry, as well as the illustrator of the picture book Nobody’s Perfect by David Elliott and the middle-grade series the Misadventures of Edgar and Allan Poe by Gordon McAlpine. Sam Zuppardi lives in York, England.